I'm reposting a link to the Radioclash website (click the title above) for a series of compilations entitled "It Ain't Girl Talk, it's BETTER" put together by Tim of Radioclash (and mashup producer Instamatic), for those people who are under the misguided impression that Girl Talk does good mashups. These, my friends, are much better. Click and download. Click and download. The daughter of Jerry Siegel, the co-creator of Superman, said her father loved Cleveland because it was the first city to embrace a character who would one day be one of the most recognizable icons in the world. While in town visiting relatives, Laura Siegel Larson attended a meeting of the Siegel and Shuster Society and said her father would be proud of the work the group is doing to promote Cleveland as the home of Superman creators Siegel and Joe Shuster. Lou Ferrigno Joins Controversial Arizona "Posse"
The Tokyo Metropolitan Government has decided to re-introduce a revised bill to restrict manga and anime with explicit sexual depictions of children during the parliamentary session that begins at the end of this month. The bill would amend the Youth Healthy Development Ordinance to add these materials to the existing 'harmful publications' classification, and thus restrict their sales and renting. Good list, except that I've never been a fan of Birdland (which I believe is the only Eros Comics publication I own). I picked up the book on the strength of being a huge Love and Rockets fan and loving the work of Los Bros Hernandez (singly and together). This list has added to comics that I want to track down with Niplez n Tum Tum and Small Favors. Dirty comics have been around almost as long as the medium itself. No doubt a few years after the Yellow Kid first appeared, some wiseacre created a Tijuana Bible of him getting busy with Buster Brown’s mom. Yen Press To Adapt The "Parasol Protectorate"
For those of you who fancy vampires and werewolves, parasols and tea, then you simply must meet Alexia Tarabotti. Some of you may remember reading a sample of Miss Tarabotti’s adventures in the pages of Yen Plus. In an alternate Victorian London in which vampires and werewolves have taken their place in high society, Alexia Tarabotti is soulless. That is, whenever she comes into contact with one of the aforementioned supernaturals, his powers temporarily vanish and he becomes mortal. This makes her quite a threat to the immortal set, and Alexia’s life of tea and biscuits is constantly being interrupted by all sorts of trouble. Yen Press is pleased to announce we will be adapting the "Parasol Protectorate" novels into graphic novel form. Keep your eyes peeled for an artist announcement soon! 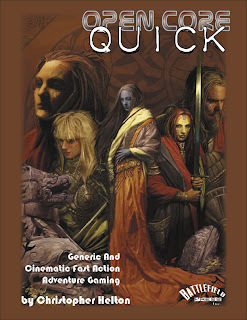 Open Core was my first public attempt at a role-playing game system. In some places it rocks as a game, but there are also some places where the seems show with the welds that I did between the various open content systems that formed my Open Core rules. There are things that I would do different today, and there are things that I could probably do better today (some may argue against that!) but, all in all, for a first try it was a good little game. I got a lot of fun hours of play out of it (as have many others around the world now) and that is all that anyone can ask out of a game. After some thought, and a brief conversation with my cohort in crime and publishing, Jonathan Thompson, I decided that it is time to close the book on this version of the Open Core system. Mind you, it isn't going to go away completely. The Open Anime game put out by Jonathan and I, and featuring the great genre advice and rules tweaks of Ewen Cluney isn't going to go away. 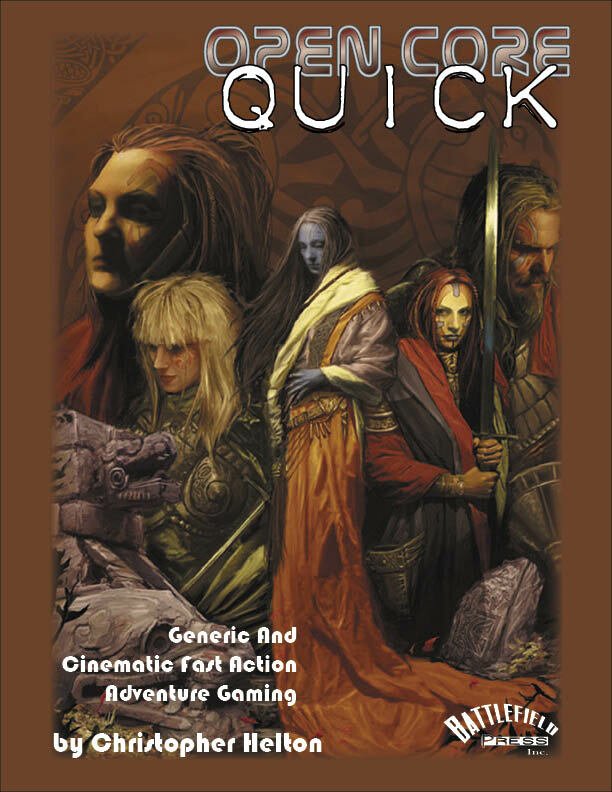 If will live, as an ongoing testament to the capabilities of the system that started when I asked myself why a game system I was using at my gaming table didn't have the powers or magic that I really needed for a game. It is always great to see someone take what you came up with and run with it in ways you might not have expected. Now, Open Core isn't going away, not completely. 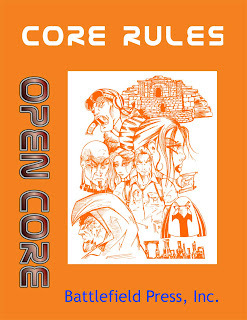 As some of you may know, I also designed a lighter version of the Open Core rules called Open Core Quick. Quick (as we've always called it internally) came about for a few reasons (one of which has always been kept a secret in public). I had been experimenting with streamlining the rules of Open Core for my personal games. The long that I'm a gamer, the less rules I seem to want at the table, so for my own play I pared and trimmed and boiled things down to their essence over time. And then we started negotiating for a licensed property and I said "Hey, I have a system I've been playing that could work for that." The license was Robotech, and ultimately there was a parting of the ways during the licensing process and you all probably know who ended up with the license (again). That left us with a perfectly good system sitting around. A few rounds of playtesting and we decided to release Open Core Quick to the world. People have liked it, too. Usually different people than those who liked Open Core, which is perfectly cool. Since parting ways with Seraphim Guard two of the primary things on my plate have been relaunching Open Core and Open Core Quick, since both of these are my game design babies. I've been puttering around with both systems trying to get them to a point where I can release them on to an unsuspecting public. Then Open Anime came out and I decided that I was pretty happy with what we had done with the Open Core system build for it, but it wasn't what I was interested in as a designer or a publisher any more. It will still live in Open Anime, and from talks that Jonathan and I have had it will get revisited by other hands. The future of Open Core, however, is going to be Quick. For a summer 2011 release (provided further playtesting goes well when I start that up) the second edition of Open Core will be an update of what had previously been the Open Core Quick system. Open Core will continue in a new direction and with a new design imperative behind it. Will this make all of the fans of the first edition of Open Core happy? No, probably not, but change happens and I hope that once the second edition of Open Core is release the old fans of both versions of the system will find a happy place for the new game and we will be able to gather together some new fans for it as well. Open Core is Dead, Long Live Open Core.